Measures 4-1/4" sq. ; opening for a photo measures approx. 2-1/4” x 2-1/4”. Wooden Photo Frame. Make a memorable masterpiece when you dress up our wooden photo frame with novelty jewels and glitter glue. 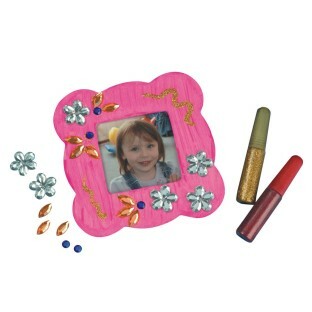 Includes wood frame, glitter glue pens and assorted gem stones. Approx. 4-1/4" sq. The opening for a photo measures approx. 2-1/4” x 2-1/4”. Pack of 12. Note: Each project is individually bagged with all the pieces. Basic decorating supplies may also be included. One instruction sheet is shared among the group. I work with clients in a psychiatric/substance use treatment setting running therapeutic groups of all kinds. This product is fantastic! VBS kids had lots of fun decorating these frames with markers and then attaching the jewels. Many kids asked to take the leftover jewels home because they found them so beautiful. My only difficulty was that the 12 pack of frames came with 3 small tubes of glitter glue....would like to have seen around 6 tubes to reduce the need to share so much....I ended up supplementing the glue supply. Generally a great value. These were used as a Mom's Day project for the mom/grandma to make with their child in the classroom. Both adult and child loved seeing their creativity.